Clementines are one of my favorite winter snacks. I love how easy they are to peel. I think the younger generation is going to be spoiled by clementines, they won’t know what it is like to peel a stubborn orange. If you have seen the Cuties commercials you know that they even market to children, “Cuties are for kids”. 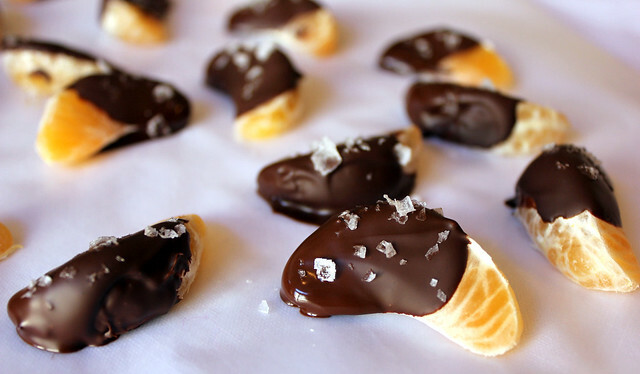 I first saw chocolate dipped clementines on the Food Network website and tried them right away since I had everything on hand. 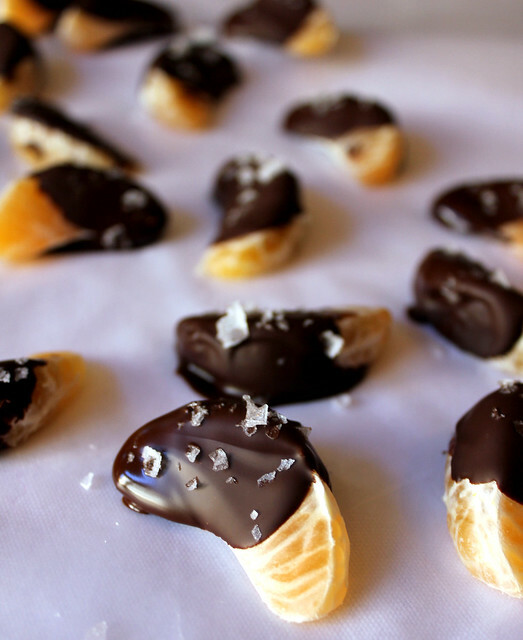 The combination of juicy citrus, dark chocolate, and sea salt is delicious. I used Maldon sea salt since it is so pretty and I like pretty things. I totally hoard my Maldon salt and only use it when it adds to the presentation, like in these flatbreads with sea salt,honey, and thyme. I melted 1.5 ounces of dark chocolate in the microwave for about 1 minute, then dipped a few segments in the chocolate, laid them on waxed paper, and sprinkled with the salt. The chocolate dries pretty quickly, so you need to sprinkle the salt on pretty often. I was able to dip two clementines with that amount of chocolate. Such a fun sweet snack to have on hand! Love this, chocolate and orange and just made for each other... yum!! !